Posted bynettigo	 2016/02/25 Leave a comment on Void not ignored as it ought to be? What? First of all – there is a bug in code. The only problem is with IDE reporting it in wrong place. 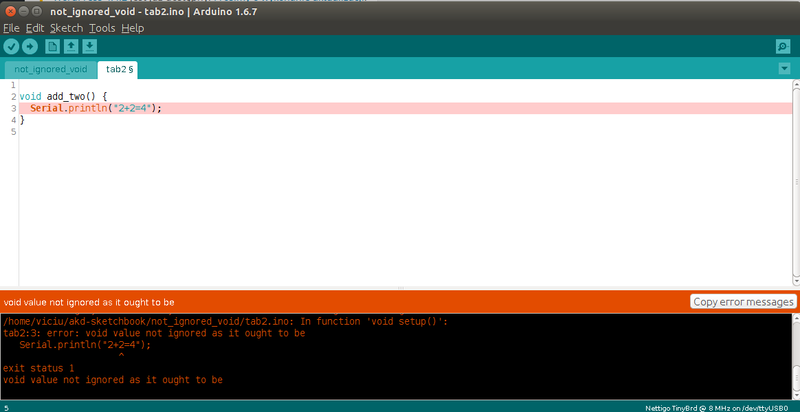 So… This relates to Arduino IDE 1.6.7 and void value not ignored as it ought to be error only. This error is reported, when You create a function which has type void, and later You try to use this function as it would be returning some value, for example – assign it to some variable. And as You can see, this is an error – we try to assign value returned by add_two() to int variable. Since add_two returns no value, compiler does not know what should be assigned as val.